IMAGE: File photo of 30km/h 'slow zone' signs. — 30km/h will not be extended to main roads except outside schools. 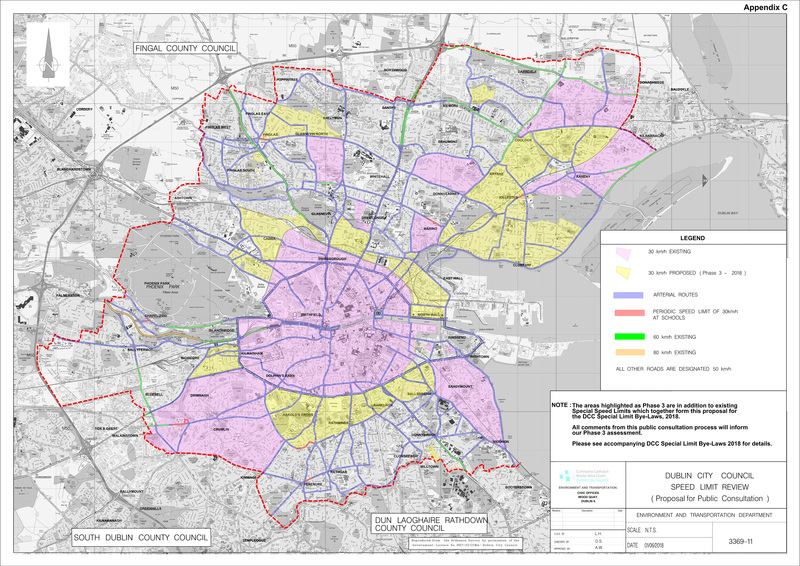 A phased expansion of 30km/h speed limits is to be expanded in the Dublin City Council area again this year. The latest roll out of 30km/h zones will exclude main roads, except for proposed periodic speed limits outside schools. According the the council, the areas chosen for this phase are based on submissions from elected representatives and members of the public over the past couple of years; consideration of roads and streets that include an engineered layout and design and the potential for introducing a self enforcing speed limit; assessment against the accident data base and close consultation with the Gardai, and information from speed surveys of the existing speeds on candidate roads and streets. Details can be found at dublincity.ie/speedreview and submissions can be made via consultation.dublincity.ie by 5pm on Tuesday 24th of July.